Berlin Golden Hat is an ancient artefact found in Southern Germany. 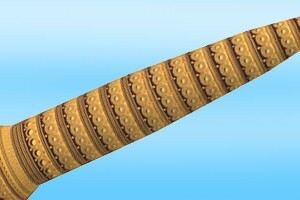 It is made of a thin gold sheet and according to historian it was made in Bronze Age 3000 years ago, 1000 BC. Study shows the symbols or patterns around the hat are some sort of calendars, both solar and lunar calendar. 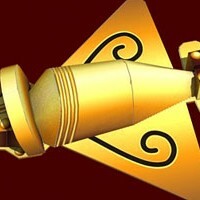 This is one of four gold hat or cone which found in Europe. It is now in the Neues Museum in Berlin. I first found out about this from watching a tv show called Museum Secret in BBC Knowledge channel. This is my first paper model template in 2014, to fill the ancient history category. I want to look back Paper Replika in 2013, I kind of regret I didn't as productive as in 2012. I admit, I was a bit disoriented. There's a time when Paper Replika has new template design every week, but it was not happening in 2013. So here is my resolution, I will put more time and more focus on paper model in 2014. 2014, I like the sound of it. Happy New Year to you all. This model may looks familiar for those who ever saw my own depiction of Illuminati pyramid model. 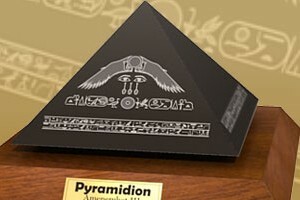 That was just my imagination though, but this latest pyramid model is a real deal. This so called "pyramid capstone" can be seen on museum on Cairo, Egypt. According to some articles about pyramid that I have read, the pyramids in their time was not like jagged stone bricks like we seen in our time. Those pyramids some covered with white limestone with smooth surface, and clean look, like modern building today. On the top of each pyramids there were a capstone, some made by red granite. There is one black granite that belongs to a King from Middle Kingdom (12th Dynasty : 1860 BC to 1814 BC), the name was written on that capstone, he is Amenemhet III. There's also inscriptions on it that says "Amenemhet beholds the perfection of Re". Re is the Ancient Egyptian Sun God. For quite sometime I am not adding up any update on Ancient History category, so this is it a model of Ancient Japanese Dogu. Dogu simply means a “clay figure" in Japanese, thanks to my Facebook friend from Japan Iro Dorry who also helped me provided the Dogu in Japanese writing. 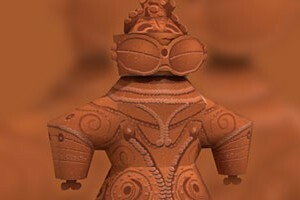 This “Dogu" is some say a representation of a spirit, others say it was an Idol figure of a woman that symbolized a fertility which also found in other places in the world including Europe. Dogu came in many shape, but this one is with a distinct style, It is the goggle detail that made this style unique. Because the strange shape that was quite beyond its era, some Ancient Alien Theorist believe it was a depiction of an Ancient alien who visited Japan in distance past as seen on TV program on History Channel. That show is one of my favorite tv show :). This template contains 3 pages of patterns including a display stand. 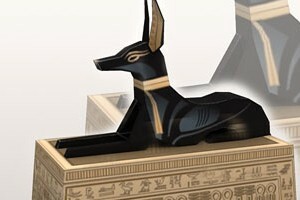 This paper craft template is a model of ancient box found inside the tomb of Tutankhamen. Ancient history has always fascinate me, especially Ancient Egypt. One of the greatest human achievement in their time, and one of the most mysterious one. I stumbled upon an article at New Dawn Magazine site about what was Sphinx really is. It's very intriguing to read that article, the point is The Sphinx monument is not like all other Egyptian art work, which always involve proportion but Sphinx's head was not. It's like someone has modified the original statue, the author mention about the real Sphinx is not a lion, but it's a jackal depicting the jackal head god, the guardian of the necropolis, the under world god, Anubis.